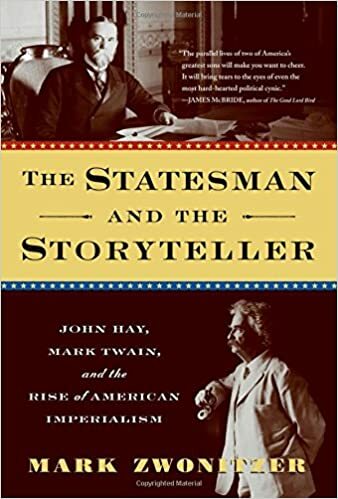 In a dual biography covering the last ten years of the lives of friends and contemporaries, writer Samuel Clemens (aka Mark Twain) and statesman John Hay (who served as secretary of state under presidents William McKinley and Theodore Roosevelt), The Statesman and the Storyteller not only provides an intimate look into the daily lives of these men but also creates an elucidating portrait of the United States on the verge of emerging as a world power. And just as the narrative details the wisdom, and the occasional missteps, of two great men during a tumultuous time, it also penetrates the seat of power in Washington as the nation strove to make itself known internationally--and in the process committed acts antithetical to America’s professed ideals and promises. The country’s most significant move in this time was to go to war with Spain and to eventually wrest control of Cuba, Puerto Rico, and the Philippines. In what has to be viewed as one of the most shameful periods in American political history, Filipinos who believed they had been promised independence were instead told they were incapable of self-government and then violently subdued in a war that featured torture and execution of native soldiers and civilians. The United States also used its growing military and political might to grab the entirety of the Hawaiian Islands and a large section of Panama. As secretary of state during this time, Hay, though a charitable man, was nonetheless complicit in these misdeeds. Clemens, a staunch critic of his country’s imperialistic actions, was forced by his own financial and family needs to temper his remarks. Nearing the end of their long and remarkable lives, both men found themselves struggling to maintain their personal integrity while remaining celebrated and esteemed public figures. Written with a keen eye--Mark Zwonitzer is also an award-winning documentary filmmaker--and informed by the author’s deep understanding of the patterns of history, The Statesman and the Storyteller has the compelling pace of a novel, the epic sweep of historical writing at its best, and, in capturing the essence of the lives of Hay and Twain, the humanity and nuance of masterful biography.